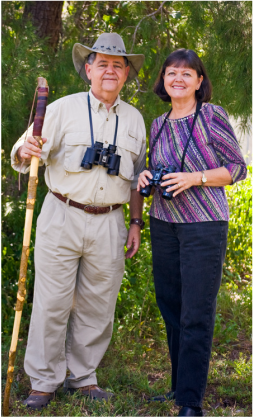 Join Bill and Merilee Clifton - creationists, science educators, authors, and Florida Master Naturalists – as we focus on astronomy in an “out of this world” workshop! We’ll compare and contrast the biblical and secular worldviews of astronomy. Topics include astronomy versus astrology, astronomy in the Bible, the earth, moon, stars, constellations, meteors, planets, our Solar System, galaxies, and the universe. Mr. Clifton will present a fascinating astronomy program, and we will make astronomy crafts. The highlight of this workshop will be a “Gospel in the Stars” astronomy presentation in the STARLAB, a portable planetarium. PLEASE NOTE: This workshop is best suited for ages 7 and up. The presentation inside the STARLAB is not suitable for preschoolers. The Cliftons will help your group learn about the wonderfully designed world all around us. They will personally lead your group in each workshop providing a unique and fascinating perspective of God’s great design in Creation. You have the option of scheduling a single workshop or you may schedule TWO workshops (same or different workshops) ON THE SAME DAY. If you schedule two workshops, participants may come to either one or both of the workshops. Registration deadline for minimum number of paying participants is usually four weeks before the scheduled activity. Minimum number for this workshop: 40. Maximum number for this workshop: 70. Cost per person for one astronomy workshop: $8.50 for child or adult. Minimum charge for one astronomy workshop: $340, if you have less than 40 participants ($8.50 x 40 = $340). Cost per person for two astronomy workshops on the same day: $15.00 for child or adult. Minimum charge for two astronomy workshops on the same day: $600, if you have less than 40 participants ($15.00 x 40). Minimum charge for one astronomy workshop and one other workshop on the same day: $540 if you have less than 40 participants ($13.50 x 40). Science Partners' home office is in Longwood, FL, north of Orlando. If your workshop site is 50 miles or less round-trip, there is no mileage charge. If your site is over 50 miles round-trip, the charge is $0.50 per mile for the amount OVER 50 miles. Your group may choose to pay the mileage expense separately or add enough to your registration fee per person to cover the amount. Please contact Science Partners if your location will involve air travel or overnight stays. Join our next The Heavens Declare! workshop on Fri., May 3, in Orlando.